Last night, "R" and I were out running errands and had no plan for dinner. With our stomachs rumbling, we found ourselves near Seven Hills. Suddenly, "R" zoned in on trying Eddie's Pizzeria Cerino for the first time, and we were off. The restaurant is located in a small plaza, so parking was very easy and free. Immediately, I was struck by how warm, cozy, clean, and new the restaurant looked. If the food was half as good as the place looked, then we were in for a treat. We were seated right away, and immediately our server came over to take our drink order and to deliver a huge basket of fresh focaccia bread. It was so soft, and lightly salted. I couldn't get enough! Seriously, we took the leftover bread home in our to-go box because it was that good. We decided to share an order of the Parmesan Zucchini Planks with hand-breaded zucchini served with marinara and lemon aoili ($6.95). They were large, and the order included six. I do wish that the zucchini was cut a tad thicker, because it was a little lost in the breading. However, it was fried food, so of course it was tasty overall. I liked having the two options for dipping, but the lemon aoili was my favorite. Of course, we had to order pizza. So we went with one of the hand-tossed specialty pizzas--- Wild Mushroom with white sauce, three types of mushrooms, roasted red peppers (only on half), ricotta silata, mozzarella cheese, and Italian parsley ($11.95 - $21.95 depending on the size). The crust was relatively thin, with a great crisp to it while maintaining some doughy softness. This is exactly how I personally like my crust. We also added roasted garlic for $2 extra. The mushrooms had great flavor, and I really liked this combination of toppings. Overall, a pretty darn good pizza. While I still haven't found a pizza place that makes it quite like my favorite from back home, Pizzeria Cerino might just be up there in terms of top spots that I've been to around Cleveland. I will most certainly be back. They have an extensive menu of pizzas, pastas, sandwiches, appetizers, and more. The desserts were awfully tempting as well! We also poked our head over in the bar area on the other side of the wall, and it looked like a great place to settle in with a bottle of wine and a pizza. "R" and I just spent a long weekend in Syracuse, celebrating my 30th with my favorite friends from college (two of which happen to live in Cleveland-- I'm so lucky!) by reliving our college days as we visited campus and cheered on SU in their loss to Georgetown (whomp, whomp). Since I also grew up in the area, my best friend from high school, her husband, and my brother and his girlfriend were all able to join us for the festivities as well. We probably bored them with old college stories about people and places that they don't know, and we were probably the only ones that enjoyed the shoulder-to-shoulder bar crowd at Chuck's before the game, but I was seriously loving every minute of it! It was a big game for any Orange fan, for multiple reasons. We all had a list of places that we wanted to see on campus during the trip, and most of them involved food. Does anyone else get cravings for the food that they had around their college campus? You spend four (hopefully) years surrounded by these restaurants, and it can be so fun to enjoy a visit there years later. Eating that piece of pizza, sandwich, beer, etc. can bring back such good memories. For us, that included pizza and pitchers of beer at Varsity Pizza before the 'cuse game, a steak and pasta dinner at Delmonico's Italian Steakhouse on Erie Boulevard on Saturday evening, and breakfast at Cosmo's Pizza & Grill before we hit the road on Monday. Two things that I didn't get to enjoy: cheese fries from Chuck's and a BYO pita from the famous Pita Pit. Sometimes I make "R" go 20 minutes out of the way to stop there for a pita on our way home from visiting my family in Upstate NY. True story. They are not even that remarkable, but I just crave them. "R" and I rounded out the weekend with a family dinner at Joey's Italian Restaurant. It was always one of my favorite special-occasion spots in Syracuse, and it did not disappoint. We had a wonderful meal with excellent service, and I was so thankful to be able to spend the time with my entire family there. I also found a new favorite pasta dish on their menu--Tortellini Carbonara. Overall, my birthday was simply wonderful. A near perfect day, and the celebrations aren't quite over yet. I have a big birthday bash weekend planned with my college friends as we travel back to campus and watch SU take on Georgetown. Then, I'll be celebrating with my family at one of our favorite Syracuse restaurants. Lastly, an epic dinner party back here in Cleveland. This birthday will carry on for close to a month. But, it's 30...that's allowed, right? One piece of my actual birthday that didn't live up to our expectations was dinner at Parallax Restaurant & Lounge. We are big fans of Chef Bruell's restaurants, but we haven't been back to Parallax in five years (even though it's the closest to home). We've been meaning to get back there, so it was an easy pick for my birthday dinner with "R". It was a Tuesday at 6:45PM, so we easily got a reservation and the restaurant was only slightly over half-full the entire time that we were there. However, a VIP table of basketball players and coaches were seated next to us shortly after we arrived (still not sure who they were after scouring rosters online). Immediately, our level of service went downhill. Placing our food order took forever, we had to flag down another server in order to get a second round of drinks, food/beverages were slower arriving at the table, and it just wasn't the experience that I think we would have had otherwise. Overall, the food wasn't that great either. We decided to share two small plates to start the meal. 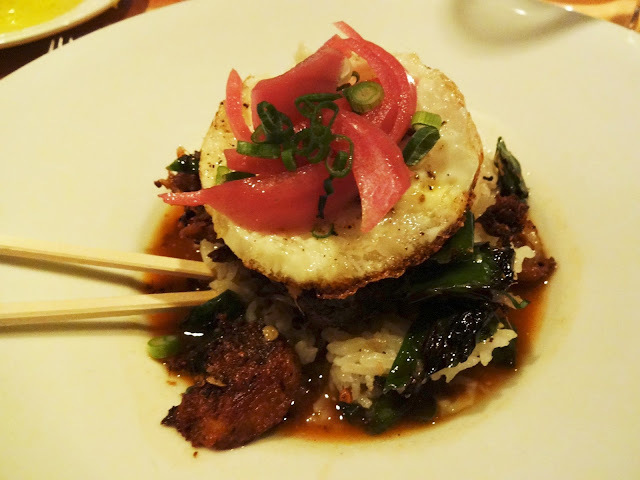 We ordered the Pork Belly Chiroshi with shishito peppers, fried egg, and mustard broth ($11). The pork belly had already been pulled apart into small pieces, so the fatty, buttery texture of good pork belly that we love was lost in this dish. The pieces were just a little too crispy. Also, I LOVE spicy food, but there were bites of this dish that I felt overdid it just a bit. It was good, but not great, and I probably wouldn't order it again. Parallax is also known for their fantastic sushi, so we couldn't completely miss out on this even though I wasn't in the mood for rolls. We decided to share the Nigiri Sushi Combo of Tuna, Salmon, and Yellowtail ($14 for two pieces each). The fish was clearly very fresh, and I enjoyed it, but you can get good nigiri like this at several other restaurants for a lower price tag. I'll stick to Pacific East. However, I would like to go back to Parallax to try some of their specialty rolls. For my entree, I made a last minute decision to switch from the scallops to the Soy Lacquered Mahi Mahi with ginger fried rice and shishito peppers in a pineapple nam prik ($24). Sadly, overall the dish was very dry and a little bland. There were also way too many peppers on the plate. It wasn't terrible, but I certainly wasn't thrilled with my selection. I enjoyed my bites of "R's" Vietnamese Chile-Garlic Shrimp more, but he wasn't in love with his dish either. For the hefty price tag, we weren't overly impressed with our meal, and it didn't leave us wanting more. We've had much better experiences at his other restaurants (Chinato, L'Albatros, Cowell & Hubbard, Table 45), so I think that it may be another five years before we find ourselves back there again. 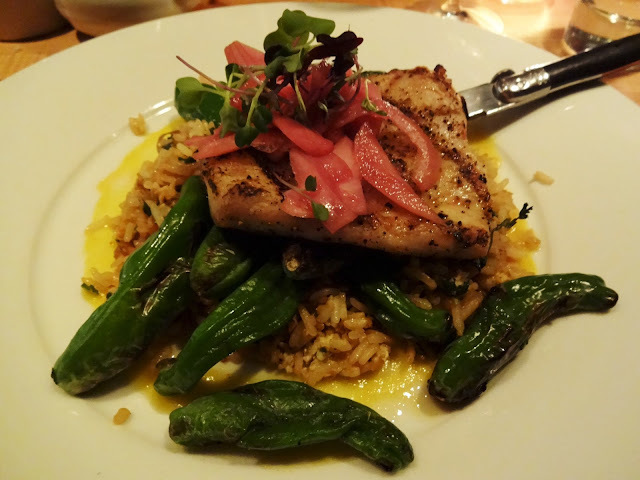 Do you have a favorite Bruell restaurant? It's time to select a winner of the GV Art & Design T-shirt giveaway...drumroll please....random.org has selected---#34, Sarah from Cooker Girl! Wow, how often does that happen that it picks the last comment? Congrats, Sarah. Please email me to claim your prize. After the Great Big Home & Garden Show last weekend at the IX Center, "R" and I were hungry and wanted to stop for lunch on the way home. We were in luck, because Stampers Bar in Fairview Park wasn't too far away, and it is on my 2013 "To Dine" list. I had originally selected Stampers from the list of reader suggestions, because it has an extensive menu of bar favorites and some interesting twists to classic dishes. They have plenty of smaller plates, which was great for us because we were in the mood to share a few items. We tried the Soft Pretzels with a side of Oktoberfest cheddar cheese sauce ($6.50). They were plump, doughy, and the cheese sauce had a nice distinct beer flavor to it. We shared an order of the Crab Cakes with two pan-seared crab cakes served Maryland-style with sides of spicy mayo and dijon mustard ($9.99). They were plump and packed with crab. I love a good crab cake that doesn't use too much "filling" or breading. Just give me crab, and these cakes certainly fit that style. It was my favorite dish that we tried. We also split the Tuna Tacos ($14.50) with sushi-grade tuna served with pico de gallo, wasabi mayo, and mixed greens in locally made corn shells that are fried to order. It came with three tacos, but I still think that the price was a little high for tacos. They were certainly decent, but didn't pack a whole lot of flavor, so overall we weren't thrilled. I probably wouldn't order them again, and the tuna tacos at The Oak Barrel in Valley View are definitely better. With a menu full of tempting choices, I would prefer to try something else at Stampers instead of ordering this again. Now, it's a bar, but it is family-friendly. Bright and sunny during the day (thanks to the huge glass windows in front), it was really pleasant to dine at for lunch. Our server was attentive, and knowledgeable about the menu. Service was relatively quick, and I left there thinking that I would certainly be back. The menu is just different enough to set itself apart from your typical bar, and it's a pretty big space with lots of seating. There is a small parking lot to the left of the restaurant, and some street parking out front. Overall, we enjoyed our meal and I'm looking forward to a return visit. They have a special every night of the week, which is rare. This includes Sunday Steak Dinner for $9.99, Friday Fish Fry, and Monday Burger Night for $3. Check out all of their specials on the website. The kitchen is open until 11:00PM Sunday-Thursday, and until midnight on Fridays and Saturdays. You can often find live music there as well. Have you been to Stampers? Happy Valentine's Day, readers! I think this is a day to just appreciate anyone, and anything, in your life that you love. Of course, I enjoy "celebrating" the day with "R" now, but when I was single, my girlfriends and I chose to honor the day by naming it "Black-out Valentine's Day" and hitting the bar scene around our college campus. I think it's a day to remind us to take a few minutes to tell the people that matter to us that we love them. So, in honor of this day...I'm sharing something with you that I "love" right now. I love that the newly opened The Oak Barrel restaurant in Valley View has some of my favorite dishes from the classic Deagan's menu on it. Chef Demetrios parted ways with Deagan's several months back, and he has now opened a new place that feels comfortable and familiar, featuring his style of food and many of the favorite dishes that you can't find on Deagan's menu since the chef change. Originally, it was the reappearance of the Ahi Tuna Taco on The Oak Barrel's Taco Tuesday menu that drew me in. You can find five kinds of tacos on the regular menu at any time (which is awesome), but then on Tuesdays the tacos are on special (even better). On this particular visit, I ordered an Ahi Tuna, Spicy Shrimp, and Carne Asada Steak. The tuna was my favorite, and the steak was my least favorite. However, I did enjoy all of them--minus the cilantro stems found throughout all three. "R" and I also started the meal with an order of the Crisp Calamari with wasabi honey and sweet chile ($10). Sweet and spicy, but a little too heavily breaded for my taste, the dish was good but not great. With many other tempting small plates on their menu, I probably wouldn't order this again. The restaurant resides in the old Hoggy's space, near the movie theatre, and easily accessible from the road with plenty of parking. It's just a few minutes from Independence, so it's convenient to get to from the highway, and relatively close to home for us. I like the interior changes that they made, and the drink menu is just as lengthy and full of great options like the food menu. Many great craft beers to choose from! Since our first visit, there has been one more trip there already. I ordered the Amish Chicken Wings with green onion, soy chile jam, and bleu cheese ($8), and the Croque Monsieur flatbread with house smoked pork belly, gruyere cheese, bechamel, and local egg ($14). The wings were fine, maybe a little too saucy, but I did like the flatbread a lot. It was thin and crispy, and I'd like to try some of the others. The pork belly pieces were a tad too think-cut for me. It made them a little chewy, which I didn't care for. But the overall flavors were great. So, I am a little bit "in love" with this place, and thrilled that it finally opened. Deagan's continues to do well, and The Oak Barrel has been very busy both times that we've been in. This is one happy foodie. Have you been yet? What did you think? Also, don't miss their Crabby Mondays or Wine Wednesdays! Check out the website for more information on these specials. Enjoy your Valentine's Day, however you celebrate. Me? I'll be enjoying a meal at Flour tonight with "R" and cuddling my dog a little extra today. Thank you for all of the birthday wishes, everyone! Between the comments on my birthday giveaway yesterday, my Twitter feed, Facebook wall, email, and phone...I certainly felt loved as I celebrated turning 30. Boy, did I celebrate! On Fat Tuesday, it was very fitting and we certainly indulged all day. 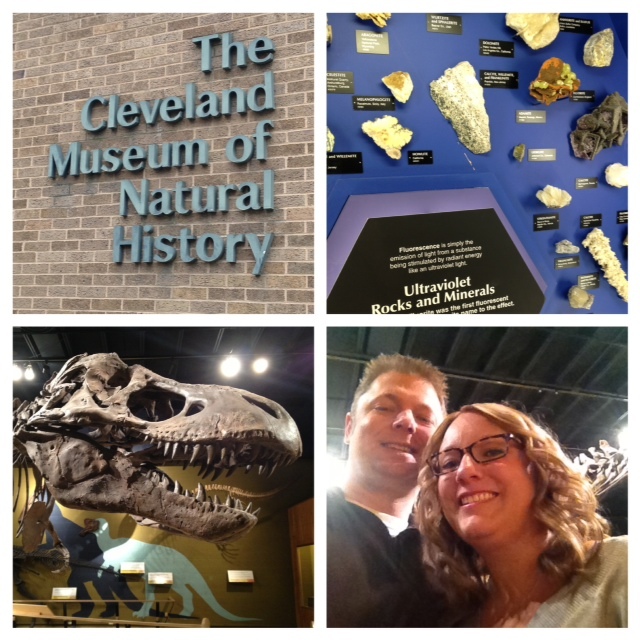 I had an amazing day with "R", as we played hooky and enjoyed a fabulous day out in Cleveland. 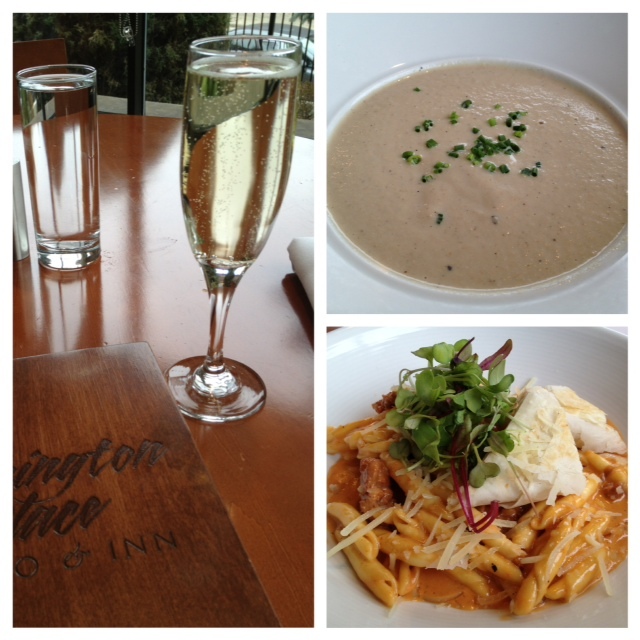 It started with a lunch date at Washington Place Bistro. Bubbles were necessary, and I had their Mushroom Soup and Mack & Cheese. All of it was so delicious. This is such a great spot for any special occasion meal. Then, we headed over to the Cleveland Museum of Natural History. "R" hadn't been since his fourth grade trip, and I've never been-- so it's been on our to-do list for a while now. Since it was a chilly Tuesday in February, we almost had the whole place to ourselves as we checked out the exhibits and watched a show in the Planetarium. Ladies, did you know that they have an entire room dedicated to gems? It was gorgeous, and I was drooling. It certainly had many exhibits geared towards children, but I think there was enough there for adults to enjoy it as well. Something for everyone, and I'm glad that we went and visited. For the two hours that we spent exploring, it was worth the $32 price tag (for two people). Next up? A stop at Gallucci's Italian Market on Euclid. "R" often shops there for spices in bulk (it's dirt cheap), but I've never been. I didn't realize that they had a deli counter, fresh pastas and sauces, a wine section, a cheese counter, and so much more. We picked up some interesting bruschetta dips, fresh pasta, and two kinds of cheese. What a fun place! Our last stop before heading home was at A Cookie and A Cupcake. What birthday is complete without cake? And they have my favorite cupcakes. I love their German Chocolate. It was a perfect sweet treat to end our Cleveland "staycation" day. Thank you again for all of the birthday wishes. If this is what 30 feels like, then I'm pretty pumped for this next decade of my life! In honor of my 30th Birthday (it's TODAY, TODAY), I'm hosting a fun giveaway, courtesy of GV Art & Design. They are a local creative boutique, with Cleveland pride just pouring from their web pages. They have some of the best T-shirts that I've seen, representing our fine city. 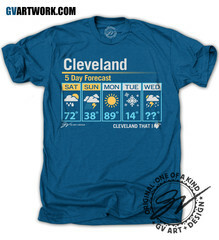 They offered me a T-shirt in exchange for this post, and I selected their new Cleveland 5 Day Forecast shirt. I think this shirt is hilarious, and I planned on purchasing one as soon as I saw it. Instead, I get to partner with this awesome local company to give one shirt away to a lucky reader! You'll get your choice of shirt, and there are lots of great ones to choose from. I've got my eye on some of the Browns-themed ones for this fall. All you have to do is wish me a "Happy Birthday" in the comments section below, and you'll be entered to win the giveaway. You can also tweet "I want to win a CLE shirt from #GVART at @BiteBuff's birthday giveaway here http://tinyurl.com/c24zgep." Make sure that you leave a second comment for your tweet, and you can do it once a day. On Monday, February 18th, I'll select a winner using random.org. Show your CLE pride with a great shirt from GV Art & Design! Now, I'm off to go celebrate my birthday with "R" on a special staycation day. - Order gourmet, long-stem, chocolate-covered strawberries from A Cookie and A Cupcake in Tremont for just $24. Place your pre-order today at contact@acookieandacupcake.com or by calling 216-344-9433. - Starting Tuesday, it's "Valentine's Week" at Nighttown. Head over to Cleveland Heights for some great jazz music with your special someone. Visit their website for a full listing of the performers. - Head over to Whole Foods in University Heights to pick up lobster tails on special for only $8.99, and make a romantic meal at home. - Spend Valentine's Day "under the sea" at the Greater Cleveland Aquarium. For $90 for a non-pass holder ($80 if you are a member), guests will enjoy passed appetizers, a three-course meal, and a glass of champagne as you dine among the fishes. - Saturday, February 9th, Bazaar Bizarre returns for one day to the 78th Street Studios for a craft fair of local, hand-made goods for your sweetie. 10AM-8PM. - Dine at SASA in Shaker Square and enjoy one of their new cocktails- Cupid's Fiery Death. This sounds like a good one for single ladies to enjoy with their closest friends! - Dinner for two at Fahrenheit in Tremont. Couples have three package options for dinner on February 14th, 15th, and 16th. - Enjoy a special three-course prix fixe menu at Tartine Bistro in Rocky River. This is one of my favorite "romantic" spots. You must call for reservations. - Purchase tickets to the upcoming Moet Hennesy Wine Dinner at Pier W on February 26th. Four courses, with beverage pairings, as you enjoy one of the best views in Cleveland. It certainly makes for a romantic evening out! Do you "celebrate" Valentine's Day with your significant other or group of friends? "R" and I tend to keep it low-key. Last year, we made a romantic meal at home with some of our favorite foods. This year, we're dining out with friends and then heading to L'Albatros for a delicious dessert of cheese. However you decide to spend the day, enjoy it-- and take the time to tell the people that you love in your life just how much they mean to you. The first restaurant has been conquered on my 2013 "To Dine" list. Saturday night, "R" and I had plans to attend a wine tasting at Cedar Green Wine and Cheese (just $10, and they hosts these events often--check it out). It was a great opportunity to knock an east side restaurant off of the list-- The Tavern Company. Located in the heart of the Cedar/Lee area, it's a great family-friendly bar serving some delicious pub food. Parking kind of stinks in that area, but we found a metered spot in one of the lots close by and hoofed it over to the restaurant. We were dining a little early (6:00PM) because of the wine tasting, so the four of us had no trouble getting a table. I did notice that we were in the more "family"-oriented section on the other side of the bar area, since there seemed to be several kids. They were noticeably absent from the other side of the restaurant. I could have done without the screaming infant next to our table, so it's worth noting. I quickly zeroed in on the Smokey Apple sandwich with prosciutto, sliced apple, smoked mozzarella, and brie ($9). All sandwiches and burgers are served with Tavern Fries. I requested a side of the Malt Vinegar Aioli that is served with the fries on the Side Dish section of the menu, and that was so worth it. The dipping sauce was delicious! Highly recommend. I was drawn to the sandwich because Light Bistro has a similar one on their Lunch menu that I love. This version had the addition of crispy prosciutto, which gave it great flavor and texture. The cheese was all gooey and melty, and the bread wasn't too greasy. However, I think it could have used a few more slices of the apple. Many bites just didn't have enough apple flavor to it. Overall, I really liked it and would order it again. I think I may prefer Light Bistro's just a hair over Tavern Company's though. Also around the table were two flatbreads, which looked fantastic, and "R" got the Pulled Short Ribs sandwich with horseradish and crispy onions ($13). The meat was very flavorful, and the bite that I had was tasty with the horseradish and onion straws. However, the sandwich was so greasy that the bottom bun was completely soggy and dripping grease all over the plate. It was unappetizing to look at, but that didn't stop "R".